Reliable and friendly animal-loving couple. Experience with cats and dogs. Non-smokers. Hello! We are Phil and Barbie Wyard. We have been married for 26 years and have two daughters in further education. Melissa is studying British Wildlife Conservation at university and Evie is studying Film and TV Production. I work as a Business Affairs Executive for a media company and enjoy writing and other creative pursuits in my spare time. Phil specialises in teaching primary school children with special needs and also teaches guitar to pupils of all ages and is currently studying for an Open University degree in Arts & Humanities. We love exploring the countryside and coastal areas, especially in Suffolk, the West Country and Wales. We love animals and are parents (well, in reality, slaves) to a Bombay (Burmese) cat named Louie. Due to our working routine it is not practical for us to own a dog but we do love walking and looking after other people's dogs including Barbie's sister's Golden Retriever, Paddy. We have both owned dogs in the past. We would like to house-sit as a couple and occasionally one or both of our daughters would also like to accompany us. We are keen on all aspects of wildlife and being outdoors and enjoy long walks, ideally with a tea room visit along the way. As a necessity for Phil's job, he holds an enhanced DBS certificate. We are members of Essex Wildlife Trust and Greenpeace. We hope that house and pet-sitting will provide us with an opportunity to spend quiet time where we can work on our writing, in the countryside and by the coast and where we can revisit our favourite places and also discover some new gems. We are particularly fond of cats who enjoy plenty of snuggles and lap time. We are happy to look after smaller animals (rabbits, guinea pigs, hamsters etc). We would also love the opportunity to have a friendly dog accompany us on our walks. Over the years we have enjoyed holidays all over the country staying in cottages and apartments and we always ensure we leave them spotless. We have house and dog-sat for family in Felixstowe and friends in Cornwall. Our number one priority will be looking after your beloved pets and your home while we are house sitting. We are also keen gardeners so you can be sure your plants are in safe hands. You can rest assured your property and pets will be well cared for while you are away. We have frequently house-sat for Barbie's sister, including looking after her Golden Retriever, Paddy. We often help out other friends with walking and looking after their dogs. 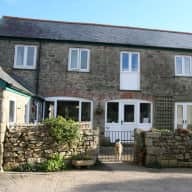 We have house-sat for friends in Cornwall on several occasions. We have lived with cats for most of our lives, and family dogs in earlier years. Barbie and Phil and their daughter Melissa were fantastic house sitters. They are lovely people and were kind and caring and looked after our dogs and house brilliantly. Barbie kept in touch every day so that we had no worries at all whilst we were away. They took the dogs to lots of places and obviously had a fun time with them. Barbie and Phil were happy to stay with us the evening before we left so that we could show them around and introduce the dogs and explain their routines. Upon our return the house was immaculate and they had even bought gifts for us. So kind! We can not recommend them highly enough as house sitters and would be delighted if they ever came to stay again. It takes a special type of personality to make others feel at ease in their own home so they can confidently go away in the knowledge everything they possess will be treated just as they would wish. We have known the lovely Wyard family for many years. They are inspired by houses and gardens and are compassionate lovers of all creatures and with a special fondness for cats. We have no hesitation in recommending them as custodians of other peoples homes, property and animals.